Bread and butter pudding is a traditional type of bread pudding popular in British cuisine. It is made by layering slices of buttered bread (often stale bread) scattered with raisins in an oven dish, over which an egg custard mixture, made with milk or cream and normally seasoned with nutmeg, vanilla or other spices, is poured. 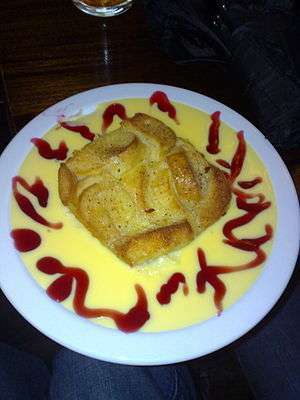 It is often served with custard or cream. It is then baked in an oven and served. Some people may serve it with custard or cream, but often the pudding under the crust is moist enough to be eaten without sauce. It is traditional to use stale bread, but old croissants can be used instead. Sometimes raspberry, strawberry, blackberry or mixed fruit jam, marmalade or other sweet preserves will be spread upon the bread, along with the butter. Other modern variations include scattering fresh grapes between the layers of bread, melting apples into the egg-milk mixture, and using unusual types of breads — such as brioche — to make it. Lemon or orange peel will add a characteristic flavour. The earliest bread and butter puddings were called whitepot and used either bone marrow or butter. Whitepots could also be made using rice instead of bread, giving rise to the rice pudding in British cuisine. One of the earliest published recipes for a bread and butter pudding so named is found in Eliza Smith's The Compleat Housewife of 1728. She instructs "Take a two penny loaf, and a pound of fresh butter; spread it in very thin slices, as to eat; cut them off as you spread them, and stone half a pound of raisins, and wash a pound of currants; then put puff-paste at the bottom of a dish, and lay a row of your bread and butter, and strew a handful of currants, a few raisins, and some little bits of butter, and so do till your dish is full; then boil three pints of cream and thicken it when cold with the yolks of ten eggs, a grated nutmeg, a little salt, near half a pound of sugar, and some orange flower-water; pour this in just as the pudding is going into the oven." In 1845, Eliza Acton suggests giving "a good flavour of lemon-rind and bitter almonds, or of cinnamon, if preferred, to a pint of new milk", then adding cream and sugar, thickened with beaten eggs. Her recipe also calls for a glass of brandy to be added to the mixture. ↑ Kasper, Lynne. "Bread and Butter Pudding". The Splendid Table. Retrieved 27 November 2013. ↑ Lemm, Elaine. 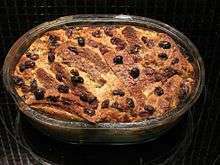 "Easy Bread and Butter Pudding Recipe". About. Retrieved 27 November 2013.